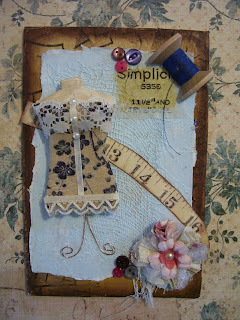 I have played with Air Dry Clay a bit and I decided to try making a dress form for an altered canvas. As you will see, it is simple, quick and very alterable. You can make them any size if you have an editing program on your computer and you will have the ability to make your own instead of searching forever online on how to make them. I have found tutorials that you can pay for the instructions but if you are frugal like me, you could spend the money on something else. First of all go to Mirkwood Designs and get your free template, look for the dress form, you may have to scroll down the page a bit. Edit in a program to the desired size you want to make...then print it off and cut it out. 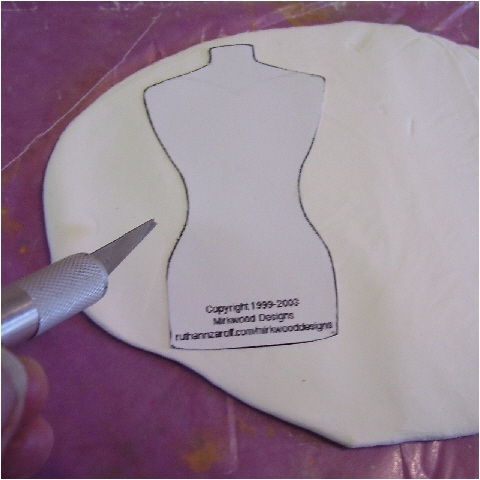 You only need one, but, if you want to make a few sizes then print and cut out. Gather these supplies: rolling pin or brayer, wax paper, cutting board, air dry clay ( I got mine at the dollar store and I recommend using white), sharp craft knife and pattern, see link above. 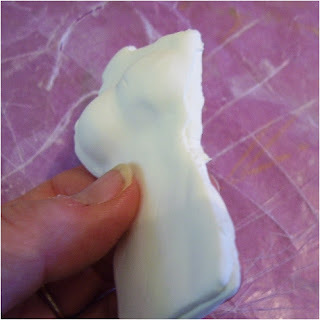 Take out some clay and place it on your wax paper. Air dry clay is very moist when you first take it out so you can do one of two things, if you have time you can leave it out for a bit, maybe half hour or so and let the air get at it, it won't dry out immediately or you can use it right away, just remember if you do that, then it sticks to itself and won't give you much play if you want to lift it at any stage. Also you can dust it with a bit of cornstarch or talcum powder before applying the paper pattern, only do this if you use it straight out of the bag. Ok now onto the next step. Fold the wax paper over the clay and roll it out. I did this because I don't have a craft only rolling pin and I have no idea what the air dry clay may contain and I didn't want to contaminate food with any foreign chemicals. Roll out the clay to about 1/8 thickness, you could do this with your hands if you want, it really doesn't have to be rolled out but if you want to make more than one torso then more is better and even thickness. 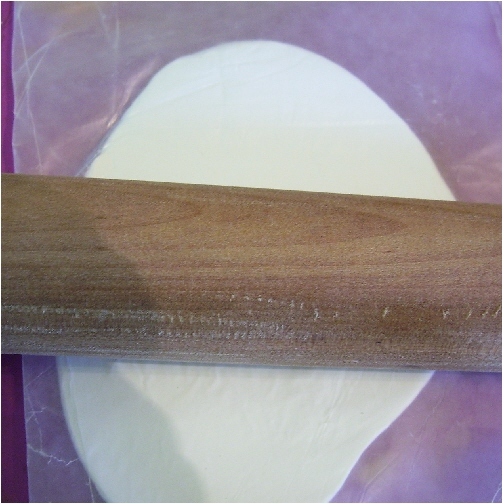 Remove the top layer of wax paper and now place your pattern with talc or cornstarch on it over a section of the clay. 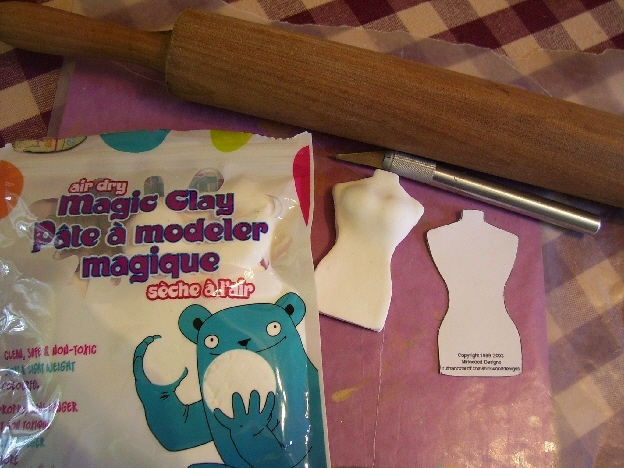 Start cutting around the pattern and pulling the clay away as you cut. Remember if it is really sticky it doesn't co operate and if you pull it too much you may distort the shape of your torso, be patient. you may end up balling it up a few times and starting over. It really is worth it in the end, you will see. 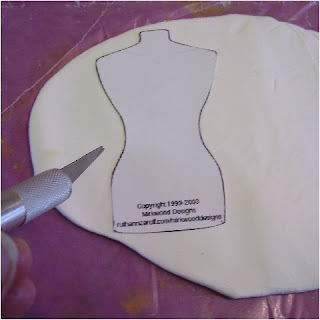 Ok you have one cut ,now cut a second torso, and, remember to have the pattern right side up as you did for the first torso, you want them to match when you place one on top of the other. 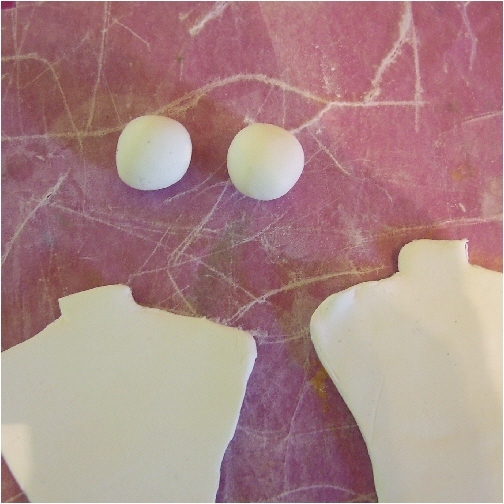 Now roll 2 small balls of clay and remember if you place them on fresh clay on the bottom piece they will stick so if you need to make any placement to see the size of the bust then place it on your paper template. I tell you all this because I learned as I went along and I don't want to cause you frustration. You will be happy I told you things so you know it could happen. If the bust looks too large then just take a bit off one ball and see if you are happy then size the other one to match. If you are happy with the bust line now you can place the 2 rolled balls of clay in the area I have shown in the picture below. 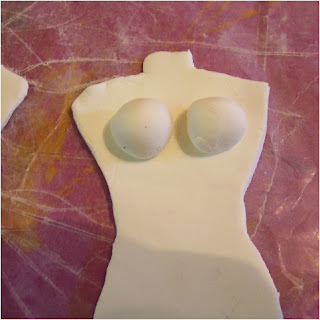 Now take your second piece of clay and carefully place it over top of the bottom torso and the bust. You may have to stretch the top piece to fit but with practise it will work. 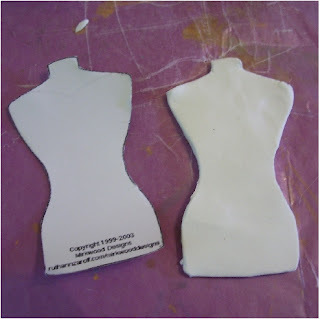 You can see below that there are some uneven edges but you can do one of two things, trim it now while the clay is still damp and then mold with your fingers or you can wait and cut it with either a craft knife or scissors after the torso has completely dried out. I have done both below, trimmed and molded with my finger to smooth edges. You don' t have to be perfect. If you are done and happy, make more and let them sit out to dry. I usually leave mine out to dry on wax paper over night. It doesn't take that long but I tend to have more than one thing on the go. And here is what I created with my air dry torso. 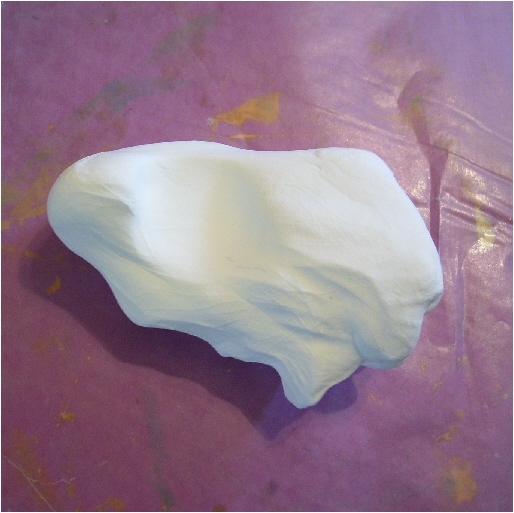 You can paint air dry clay, you can modge it or use gel medium. I used a tan with white mix and just slip slapped the paint on the torso then modged some fabric I had. Click on the canvas to view a larger image. I just love how this turned out. The one thing about air dry clay I like is it is very light. Here is a close up of just the torso. 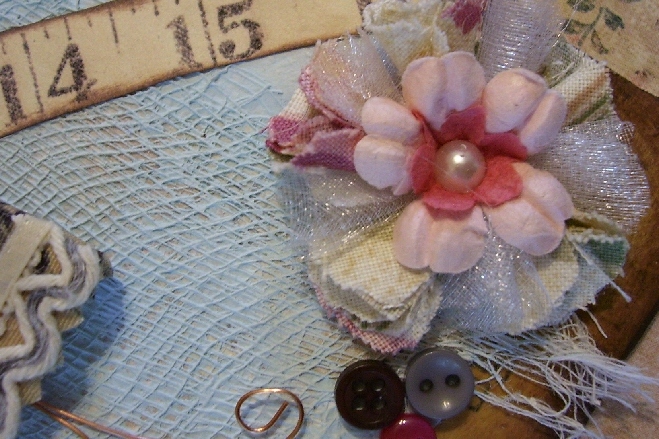 And below a shabby flower I recently made using Tim's Tattered Florals die. I hope you give this a try. Let me know how you did. Did you like this? Was I helpful? Please if you make a torso and blog about it direct people to my blog for the tutorial. I am not charging any money for this, all I ask that you give me credit for it. Thanks for dropping by and I can't wait to show you some birds of note. Thsi is a fantastic turorial!!! Wow I lvoe it - I've used that "templet" and collaged it but what you have done is just amazing!!! Well done and thanks for sharing! Wonderful! I love this tutorial- I have never made anything with clay! Thanks for the great visuals- and your project is amazing! 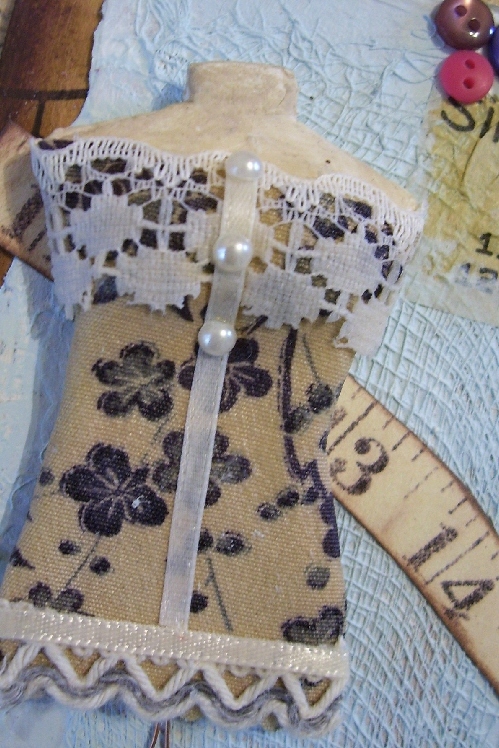 This is a fantastic dress form you have created. It really is wonderful. Happy creating...with air dry clay. Les, this is a fab tute! I've got a thing about dress-forms at the mo, so will definately give this a try! Just need to get my hands on some air dry clay first :) TFS! brilliant idea, I have air drying clay somewhere in my stash! Thanks so much for this tut! Wow that is great Leslie! I love dress forms and this looks easy enough! I even think I have some clay! Once my scrap room is set up I'm going to give this a try! Thanks for sharing! You are so clever Les! Thanks for the inspiration! Such a fantastic tut Lesley and yours came out amazing! I've used this pattern but never to create a 3-D form. Wonderful tutorial and beautiful finished product! What a great tutorial thanks for sharing and stopping by to visit have a wonderful weekend. This look like a lot of fun, I'll give it a try! What a great and unique idea to use the clay! Thanks for sharing! So generous to share a tutorial with us. Thank You!!! 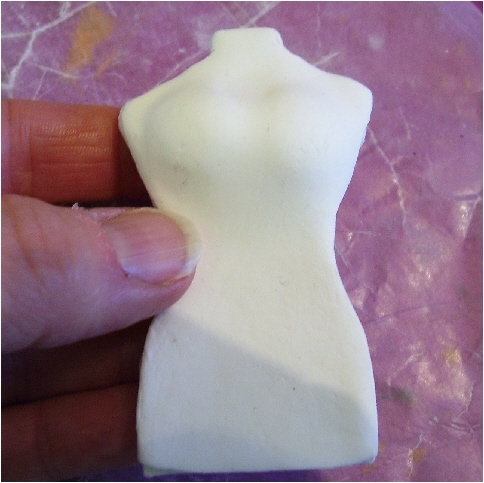 I have air dry clay which I use with art moulds but you have opened my eyes to new possibilities. Beautiful project with wonderful detail.